God Chose to Love You! Who will he choose? That’s the question everyone’s asking themselves…at least all the fans of “The Bachelor.” I got home this last week and when I sat down on the couch to relax in front of the tv, I saw that someone had just finished watching the premier of “The Bachelor.” For those of you that aren’t familiar with the program, there are thirty women who sign up to go on a series of dates with one eligible bachelor. The show is filled with drama, fantasy locations, expensive excursions, gourmet meals and of course elimination rounds, famously done through a rose ceremony. The millions who will tune into this season of “The Bachelor,” have already begun their list of those who are rose worthy and those who are just there to cause drama to boost ratings. In the end, there will only be one rose left to give and everyone is wondering if the final decision will end in true love. Whether we are fans of “The Bachelor,” or not, we can all appreciate the choice facing the bachelor. This morning we have a much more important question than who the new bachelor will choose. Today we answer the question, would God choose to love you? as handsome a young man as could be found anywhere in Israel, and he was a head taller than anyone else. Seemed like a good choice for king and probably a good contestant for “The Bachelor.” And things did start of well for Saul, until he stopped listening to God, idolized himself and became a liar. Saul’s downfall was simple, soon after he was made King, God asked Saul to totally destroy Israel’s enemy, the Amalekites. Instead, Saul destroyed most of the Amalekites, but kept the best sheep, cattle and their king alive. This made God angry and when Samuel confronted Saul about it, his excuse was that he saved the good stuff to sacrifice to God. Regardless of Saul’s intentions, he had failed to do what God told him and for that God rejected him as King. Then, God sent Samuel to anoint a new king for Israel. So, they waited for the youngest to arrive, and when he did, God told Samuel to anoint Jesse’s youngest, David, as the new King of Israel. God’s choice of David as the next King of Israel confused everyone because God doesn’t make choices like we do. If any of us were standing there that day Samuel went to Bethlehem to anoint the new king, we would not have picked David. David, or as his father referred to him “the youngest,” wasn’t even brought along for consideration when Samuel asked Jesse to bring his sons to the sacrifice. They left David out in the field to shepherd the sheep. He was the youngest, eighth in line to inherit anything from his father. He was still just a boy, he lacked experience, he lacked height and, according to Samuel, he was healthy and handsome, but this wasn’t a beauty contest, it was the anointing of a king. As far as anyone could tell, David should not have been God’s choice to be the next king of Israel, but God doesn’t make choices like we do. 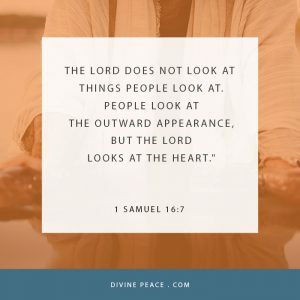 We look at the outside, but God looks at the heart. 22 But the fruit of the Spirit is love, joy, peace, patience, kindness, goodness, faithfulness, 23 gentleness and self-control. 3 For I know my transgressions, and my sin is always before me. 4 Against you, you only, have I sinned and done what is evil in your sight; so you are right in your verdict and justified when you judge. 5 Surely I was sinful at birth, sinful from the time my mother conceived me. but when the kindness and love of God our Savior appeared, 5 he saved us, not because of righteous things we had done, but because of his mercy. as a sacrifice of atonement, through the shedding of his blood. In mercy then, God can be pleased with us and love us, no longer looking at our sinful hearts, but Jesus’ perfect heart. “Both the one who makes people holy and those who are made holy are of the same family. So Jesus is not ashamed to call them brothers and sisters. We were born sinners just like our parents, but in baptism, the Holy Spirit gives us a spirit of life. 9 Hide your face from my sins and blot out all my iniquity. 10 Create in me a pure heart, O God, and renew a steadfast spirit within me. God alone changes our hearts to trust in him for forgiveness and life. As God’s chosen people, we will live in his kingdom as his brothers and sisters, as heirs to eternal life confident in the answer to our question, that through his Word, through our baptism and through Jesus God chose to love you. Amen.